Two rental facilities in Toronto and Brampton serving the north-west GTA. Each facility offers several different sizes of storage units ranging from 5 ft × 5 ft up to 20 ft × 35 ft.
Moving carts and dollies are available for your use with no extra charge. 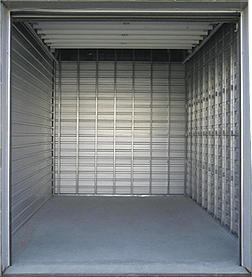 We have outside storage spaces suitable for storing your car, boat, trailer, small truck, etc. We can recommend local movers. We can recommend local truck rental companies. Our facilities are secure and safe, but sometimes unexpected things happen. We have optional insurance available at both our Toronto and Brampton locations if your own home policy does not cover insuring your belongings when they are being kept in rental storage. Our specially-designed self-storage insurance policy will protect you against common hazards, including fire, flood, windstorm, lightning, burglary, hail, vandalism, explosion and more. Ask our staff for more details. We accept Visa, American Express and MasterCard, as well as debit cards. You may reserve space over the phone with a credit card. You can create your business or residential identity by having your own suite number. You have 24 hour access to pick up your mail. We will also take delivery of important items for you and you can arrange for items to be picked up too. Both facilities are alarmed and have key code access. At Key Storage we realize that you need peace of mind that your belongings are being kept safe and secure at all times, which is why we have made all encompassing, 24/7/365 security our highest priority. Both our facilities feature 24/7/365 Video Camera Surveillance and all of our buildings are alarmed every night for further protection. We provide every client with their own, individual, computerized security access code which will be required whenever you want to enter or exit through the main gates and at the main loading/unloading areas. The code also allows us to monitor who is entering and exiting the facility and when. Both our facilities are well lit and fully fenced. We sell locks. Climate control storage space is offered at both facilities. Climate controlled space will reduce the chance for humidity and mildew type problems. We offer both heated and some air conditioned units. The 6 Tracey Blvd location in Brampton has ground level access and our 200 Suntract Road location in Toronto has both ground and truck level loading & unloading. All buildings at both Brampton and Toronto facilities feature fire sprinklers and have fire extinguishers throughout. Should a fire occur, the fire sprinklers will be activated only in the area of the incident, so preventing water damage to other units. Both our Brampton and Toronto locations offer safe, convenient, clean, secure, climate controlled metal self-storage spaces, outdoor parking spaces and portable storage at competitive rates.